Originally published in the Troy Record on Sunday, January 20th 2013. New York state has passed the most restrictive gun laws in this nations history. People are excited about it and praise it as a great accomplishment. I’ve even people comment “Amen” and post the new control measures. Because I have read so much support and come to an understanding of the reasons why gun control is a good thing, I now purpose we have religious controls. This cannot wait and should be speed through the Assembly and Senate. Why does anyone need more than one bible? Why should anyone have more than 10 devotional and/or other religious books? Isn’t the bible enough as a single book? I have done Gov. Andrew Cuomo a favor and slightly modified his words on gun control in the State of the State so he doesn’t have to waste any time preparing a statement. In the area of public safety — religious violence — has been on a rampage as we know firsthand and we know painfully. We must stop the madness, my friends. And in one word it is just enough. It has been enough. We need a religious policy in this state that is reasonable, that is balanced, that is measured. We respect clergy and believers. 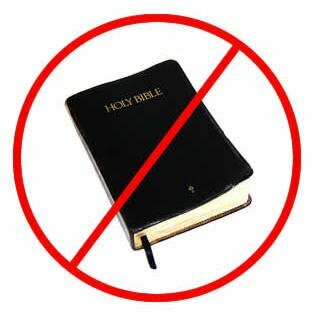 This is not taking away people’s bibles. I own a bible.. I’ve read it, I’ve even prayed. That’s not what this is about. It is about ending the unnecessary risk of large quantities of religious material. That’s what this is about. When it comes to government reform, we all believe in government. But for government to be effective, we must be trusted and the more we’re trusted the more effective we are because it’s all about the relationship that we have with the citizens of this state. I know, I know that the issue of religious control is hard, I know it’s political, I know it’s controversial. But we are proposing today common sense measures. And I say to you forget the extremists. It’s simple, no one needs ten devotionals to save a soul. End the madness now. Pass safe, reasonable religious control in the State of New York. Make this state safer. Save lives. Set an example for the rest of the nation. Let them look at New York and say this is what you can do and this is what you should do. This is New York, the “Progressive Capital.” You show them how we lead. We can do it. We’ve done it before, we can do it again. Supporting gun control is supporting religious control. And that’s just a MATTer of fact.